App intelligence company App Annie had the same idea and has put together a great report on the apps and games that have had the biggest impact. As you’ve probably noticed, the mobile industry is celebrating the tenth anniversary of the first iPhone and the birth of the app economy as we know it. It’s actually quite humbling to think that it’s only been ten years since the mobile industry as we know it was created. Without Apple’s innovation both in hardware, software and the store environment, we might still all be downloading $5 Java games from mobile operator WAP portals. Instead, mobile apps have become a fundamental part of our daily lives, in many instances replacing desktop computers and laptops and making our smartphones our go-to device. And of course, a huge part of this success story has been the creation of the mobile games industry as it is today. 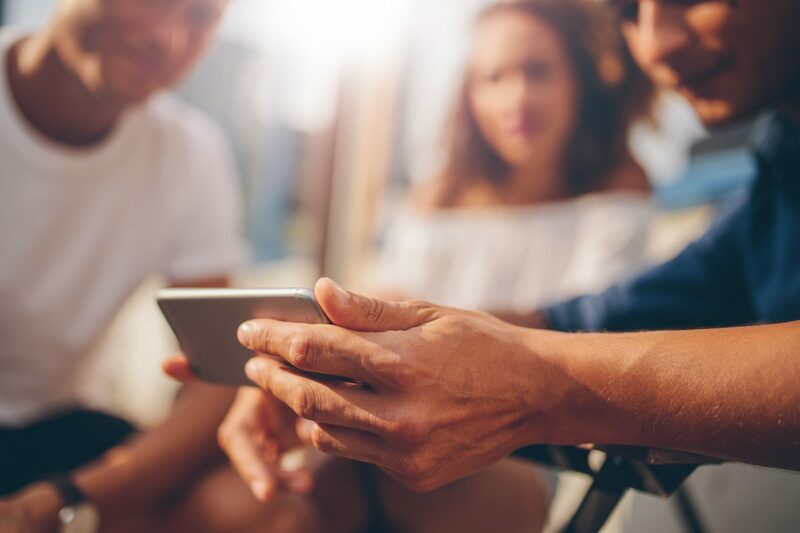 Luckily for us, app intelligence company App Annie had the same idea and has put together a great report on the apps and games that have had the biggest impact. First off, we have the top ten most downloaded iOS games of all time. Whilst there are no major surprises here, it is interesting to see Honor of Kings at number 5, showing what a massive hit this game continues to be, both in Asia and beyond. And a special congratulation must go to developer Imangi, as the only company to have two games in the top 10! Next up is the top 10 mobile games by revenues. Straightaway we can see that this list is far more international, with hit games from China, Japan, Europe and the US all making the list. 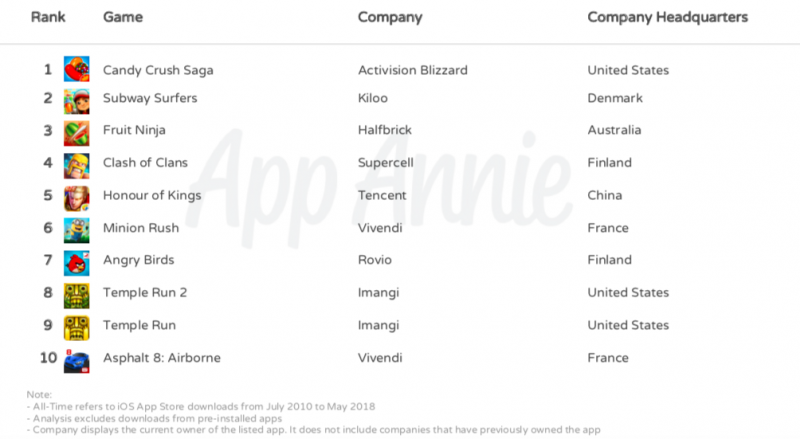 Whilst App Annie can’t reveal any exact data for commercial reasons, the report does share some interesting snippets that show just how successful all of these games have been. For example, did you know that Candy Crush has been downloaded more than 280 million times since it was launched in July 2010? Or the fact that Clash of Clans earned more than $4 billion just on iOS to date during that same time. 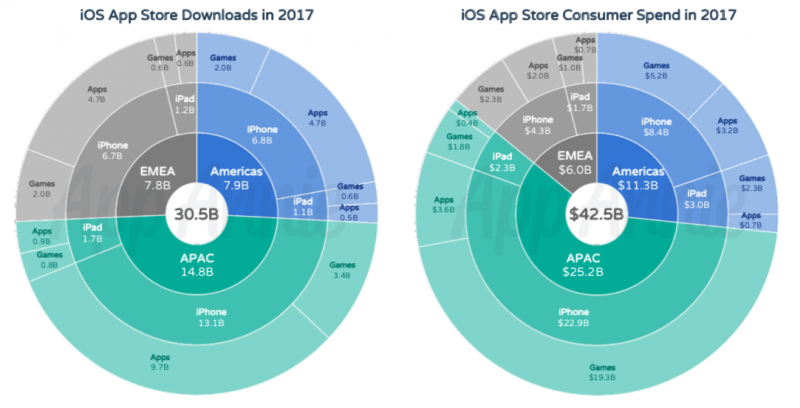 App Annie also looked at App Store downloads and revenues in 2017 to see what blend of apps and games we’ve all been downloading and playing. In terms of the downloads, games made up roughly 10 billion of the 30 billion apps installed in 2017. EMEA and the Americas are evenly split, with APAC making up almost half of the total number of downloads. 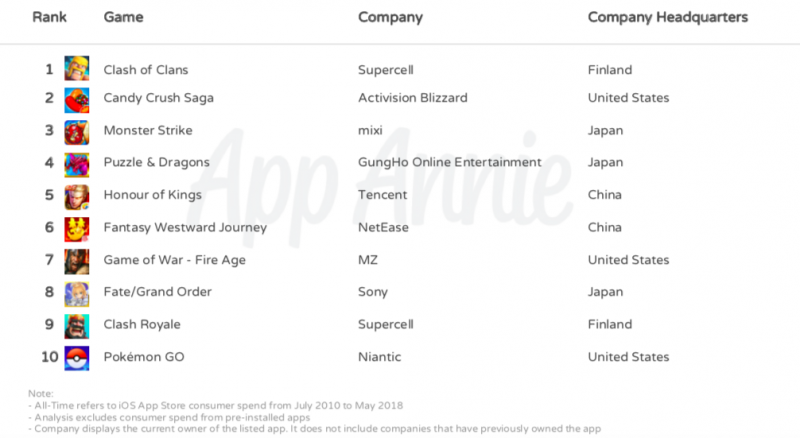 In contrast, APAC totally dominates when it comes to how much money consumers are spending using all of those games and apps. In 2017 gamers in APAC spent almost $22 billion; that’s over half of the total spend across all mobile apps and games. In comparison, EMEA gamers spent less than $4 billion, and in the Americas, they spent closer to $8 billion. And, if the huge revenues and installs coming from APAC weren’t already clear, another chart showing the regional share of downloads and consumer spend really brings the point home. Whilst things started quite evenly in 2011, consumers in APAC clearly got the hang of the App Store pretty quickly. Today, consumers in Asia are responsible for 49% of all iOS downloads, and a staggering 59% of all app revenues. As App Annie notes, the major swing happened in 2014, when Apple released the iPhone 6 and 6 Plus in China, which today continues to be one of Apple’s biggest markets. As always with these fun exercises in looking back, it also makes us think about what the next ten years will hold. Will we see games like PUBG and Fortnite topping the charts, or by then will there be some kind of totally new mobile gaming experience that we are all obsessed by? Or will the top ten still be dominated by the same games that are topping the chart today? Only time will tell. You can get the full App Annie report, The Most Popular iOS Apps of All Time, here.